Here's a quick, stylish cardigan to knit now! It's worked from the top down, which minimizes seaming, as well as giving you the option of different sleeve and body lengths! It's boxy shape and raglan sleeve shaping is suitable for girls and boys. The Girl's Version shown here has 3/4 length sleeves, which are easily converted to the hip short-sleeve length which you are seeing everywhere this season! by folding up the garter stitch cuffs. It is knit to hit the top of the hip, but could easily be worked to a more cropped length or to a longer tunic length, if desired. 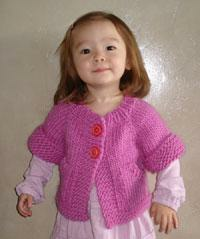 The yarn used is Brown Sheep Lamb's Pride Bulky, which comes in 79 gorgeous colors at last count!. This pattern includes the Girl's Version with the 2 buttons and 3/4 length sleeves, as well as the Boy's Version with buttons all the way down and full-length sleeves. 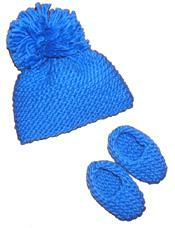 Eight Infant/Toddler to Child Sizes are included, from 6-12 months to 9-10 yrs old. This is a pattern you will use again and again!